The anniversary has been celebrated not just in Russia but all over the world. A 50-gun salute and various other celebrations have been held in Moscow. A statue of Gagarin, a gift from the Russian Space Agency, has been erected in the centre of London near Admiralty Arch. A film, First Orbit, has been made from the International Space Station to recreate what Gagarin would have seen from orbit, which has been released on YouTube. The ISS crew also recorded a video message to the world to wish everyone a Happy Yuri’s Night. And Google is featuring a themed Google Doodle on its home page (see below). There is plenty of coverage of the anniversary in both traditional media and online, but here are ten fast facts about the first man to orbit the Earth and view our planet from space. 1. 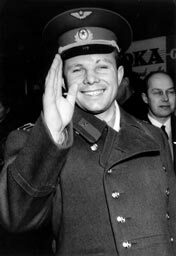 Yuri Alekseyevich Gagarin was born on 9th March 1934 in the village of Klushino near the town Gzhatsk. The latter was subsequently renamed Gagarin in his honour. 2. He was the third of four children. His two older siblings were deported to Germany during the Nazi occupation of Russia and used as slave labour. 3. Gagarin was one of 20 pilots chosen for the initial Soviet space programme. He was so popular among his fellow candidates that, when they were all asked to anonymously nominate which one of them they would like to see become the first cosmonaut, all but three chose him. 4. One of the factors contributing to Gagarin’s selection for the launch of Vostok 1 was the fact he was only 5ft 2in tall, a distinct advantage in the spacecraft’s cramped two-metre wide cockpit. 5. His call sign was Kedr (Siberian Pine). 6. In total, Gagarin’s flight lasted 108 minutes. 7. It has often been claimed that Gagarin said “I don’t see any God up here” during his orbit. However, no official record of these words exists. The quote has instead been attributed to Soviet leader Nikita Khrushchev. 9. After his safe return, he worked on designs for a reusable spacecraft. 10. On 27th March 1968, he was killed when his MiG-15 fighter crashed near the town of Kirzhach. He was just 34. His death became the subject of fervent conspiracy theories, but a KGB investigation attributed the accident to the negligent actions of air base personnel in providing outdated weather information and a failure to remove external fuel tanks. Other theories suggested the fatal crash might have been caused by a near mid-air collision or an open cabin air vent. Posted in Other stuff and tagged First Orbit, space flight, Yuri Gagarin. Bookmark the permalink. I was 5 at the time but I do remember it. Siberian Pine, huh? Rather short trees? Stunted by force of the wind? Great post. “yuri gagarin is the HERO of the world” because with out any fear he was the first man to see the space. handsoff to him……………..i really love him very much………. i wanted to do a project on gagarin and this REALLY HELPED,thanks for the information! This may be an old blog post, but I was at the Cosmonaut exhibition at the Science Museum the other day. Alas, my two girls were knackered so I didn’t truly get the chance to explore it in as much detail as I’d have liked but it was very impressive. The size of the pods they used to return to Earth were tiny. Well worth going if you can.